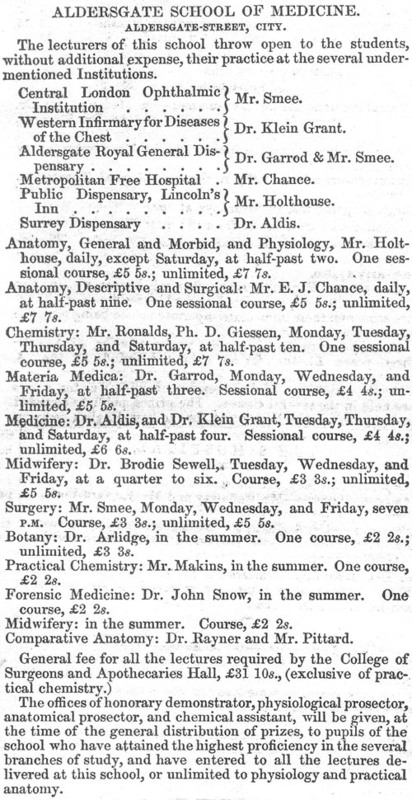 Unfortunately, the Aldersgate School of Medicine in later years could not compete with the reputation of nearby St. Bartholomew's Hospital School of Medicine, and it was forced to close in 1849. His friend who initially told him of the position went on to University College Hospital, but John Snow did not follow him, and in fact never sought another academic post. Instead he became busy with a successful medical practice and research in anesthesiology and the epidemiology of cholera. Snow, SJ. J of Medical Biography 8, 71-77, 2000. Richardson, BW in Snow on Cholera, Hafner Pub. Co., 1965. Vinten-Johansen P et al. Cholera, Chloroform, and the Science of Medicine: A Life of John Snow, 2003.